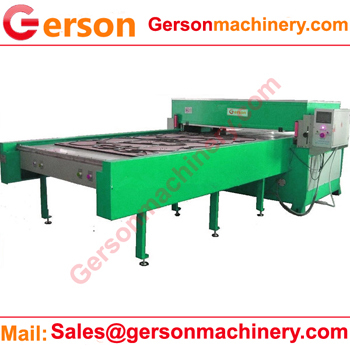 Four column full beam die cutting press machine is die cutting press mahine with four column or post which have the standard versions of Gerson GRB full beam press. 1.This die cutitng machine can punch out leatehr ,foam ,sponge,paper,cardboard,plastic sheet,eva ,pvc ,pe,rubber et., in sheet or rolls forms. 2.The machine have double oil cylinder, double-crank connecting rod balancing, four-column precise guiding mechanism, self lubricated bushings, hydraulic power unit. 3.There have manual feed table or autoamtic feeding material system with control cabinet with PLC control, automatic die finding system. 4.Gerson accept any custom build die cutting machine if you have further question related the machine .welcome to contact us .